Since the dawn of time we have been extending peace to each other. The olive branch, for example, has been one of those enduring symbols of peace. It came from Greek mythology but has been used for millennia as a sign of hope that something will grow. To have a healthy olive tree meant that peace was close by and life could flourish. Wars have ended with the symbolic extension of an olive branch between two warring parties. This Remembrance Day we are especially aware of the need for peace and for the high cost others have paid to give us the peace we enjoy today. Even as we aim for new heights in our ambition for global progress, we should remember that a golden olive branch was left on the moon by the Apollo 11 astronauts. No matter our advancement, our need for peace is always at hand. Around the world gestures of peace persist. Hebrew speaking people will often greet one another with “shalom,” which means wholeness and peace. In Christian worship for nearly two thousand years we ‘pass the peace’ with each other. It is a simple handshake and we say, “Peace be with you.” Athletes often do the same at the end of a game when, win or lose, the players line up to shake hands. In the heat of sports, as with anything, sharing a gesture of peace reminds us of what is most important. Nicholas Wolterstorff, a philosopher, wrote this: “To dwell in shalom is to enjoy living before God, to enjoy living in one’s physical surroundings, to enjoy living with one’s fellows, to enjoy life with oneself.” Shalom, this beautiful word for peace, is something that we learn to find, create, and dwell in. As Wolterstorff says, throughout our lives we learn to make peace with God, our space, each other, and ourselves. There is an enjoyment to peace and when we make peace with someone, a great burden is lifted from us. Peace is freedom. Peace is the good life. Peace is that olive tree growing between you and your neighbour. The Apostle Paul in his famous book to the Romans addresses an imperialistic and powerful culture that waged war across the known world. To them he wrote saying, “if it is possible, as far as it depends on you, live at peace with everyone.” It was a radical word of encouragement in that culture. Then, as today, the goal for many was sheer victory. To win. To conquer. To beat. To dominate. Yet Paul says that peace is the great hope. Is it possible to live at peace with those around you? 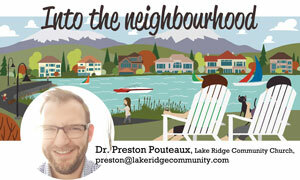 If it depended on you, would peace be found between you and your neighbours? Between you and your family? When mere words, or a social media post, can derail peace we wonder at the fragility of it all. Yet in the midst of it all we can become those who create, nurture, and sustain peace in places and in a culture where peace does not always easily emerge. May we be those who pass the peace, extend the olive branch, and propose the good life. Because peace means freedom, for your community, and for you.